Mr. Donka’s regrettable Facebook page | The Vermont Political Observer. I sure hope the Vermont Republican Party can recruit a credible candidate to run against Congressman Peter Welch in 2016. Because if they leave the spot open for the likes of Mark Donka like they did in 2012 and 2014, they might suffer a wee bit of embarrassment. Because even as Phil Scott has been busily distancing himself from the far-right extremism of the Republican presidential field, the same sort of harsh rhetoric can be found in abundance on Donka’s Facebook page. Which is basically a bunch of reposted Tea Party visuals full of conspiracy thinking, climate change denial, fear and hatred. Some of which are also, um, fake. Yeah, Mark? That never happened. A photograph of Hillary Clinton shaking hands with terrorist mastermind Osama bin Laden has circulated online (divorced from its original context) ever since it was created for a Photoshop contest held back in 2007 by the web site FreakingNews.com. Really, it’s not even a very good Photoshop. Colors, shadows, and postures don’t quite match. But that hasn’t stopped the likes of Donka from circulating this thing in hopes of “exposing” Clinton’s imaginary perfidy. 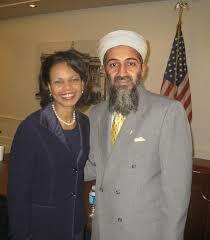 There’s actually a similar image, also from FreakingNews, of a “meeting” between Osama and Hillary’s predecessor, Condoleezza Rice. This isn’t the only time that Donka has polluted his Facebook page with spurious far-right propaganda. I hope he’s better at fact-checking when he’s writing official reports in his day job as an officer with the Woodstock police. Because on matters of national politics, he’s got a bad case of hate-fueled credulity. Please, Mr. Sunderland, find a candidate your party can be proud of. It’s been embarrassing enough for Phil Scott to be quizzed about the nutbags running for president; it’d be even worse if he has to answer questions about a fellow candidate for statewide office. 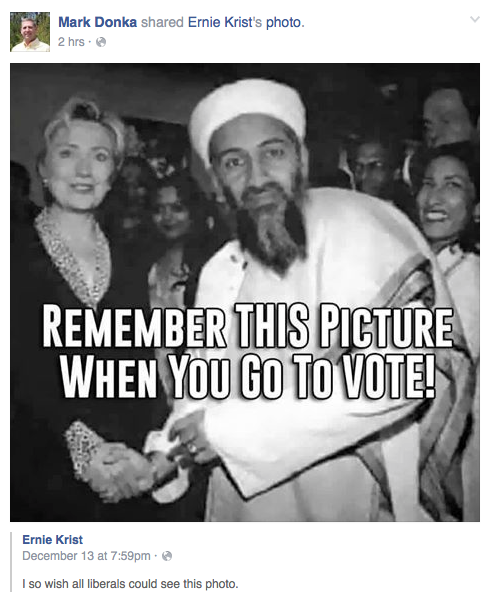 This entry was posted in 2016 election, Peter Welch, Phil Scott, Vermont Republican Party and tagged David Sunderland, far-right propaganda, Hillary Clinton, Mark Donka, Osama Bin Laden on December 18, 2015 by John S. Walters. I wonder if his sentiments are shared by others in the Woodstock PD. Not that there should be a political litmus test for serving as a police officer, but when someone possesses such a hatred toward Democrats and views them as traitorous usurpers of the Constitution, it makes me wonder how effectively he enforces the law, especially in a state where Bernie and Obama bumper stickers are so common. It’s a pretty good bet that his erroneous beliefs aren’t limited to Muslims and terrorists. The same un-sane sources that circulate the doctored picture also circulate what they claim to be “facts” and “history” that are, of course, neither. If Donka gets his news from these sources, he’s also seriously deluded about lots of other issues, including budget deficits, healthcare, and on and on and on.